IT’S TIME WE RETIRE PILGRIM—After 40 years of operation, Pilgrim Nuclear Power Station’s license is scheduled to close down in 2017. MASSPIRG is working to ensure that Pilgrim, one of the most dangerous nuclear power plants in the coutnry, retires as soon as possible. • Pilgrim’s 40-year-old General Electric Mark I reactor is the same weak and outdated design as some of those that failed in Fukushima. • A recent Nuclear Regulatory Commission report found that Pilgrim is the second-most at-risk nuclear plant in the country from a potentially catastrophic earthquake. • There are more than 1.2 million pounds of radioactive waste currently stored on site — if a fire were to occur in one of the storage pools, thousands could die as a result. • In the case of a major catastrophe, evacuation plans aren’t sufficient — families on the Cape would have to drive toward Pilgrim to get out of harm’s way, and the millions in the metro-Boston area would quickly become stuck in gridlock. While we look forward to the end of Pilgrim, we continue our 40 year fight against all nuclear power. It's inherently dangerous, potentially catastrophic and a terrible investment for our country. More than 70% of Bay Staters live within the 50-mile evacuation zone of a nuclear power plant — that’s more than 4.6 million men, women and children who are one unlikely series of mishaps away from potential disaster. There is no known safe level of exposure to radiation, and mortality rates from more than mild exposure is extremely high. The levels of radiation that could escape from our reactors in the event of an accident or natural disaster could dramatically harm human health. 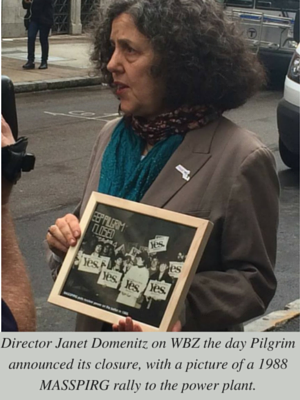 Statement of Janet Domenitz, Executive Director of MASSPIRG, on the July 7 Atomic Safety Licensing Board hearing. Airborne contamination in the wake of a nuclear accident is not the only threat nuclear power poses to water supplies. In the United States, 49 million Americans receive their drinking water from surface sources located within 50 miles of an active nuclear power plant. Leakage of radioactive material into groundwater is a common occurrence at U.S. nuclear power plants, even if the amount of radioactivity released is tiny compared to that released at Fukushima. Yesterday’s earthquake in Virginia, less than ten miles from two nuclear reactors, is a jolting reminder of exactly the type of unpredictable risk that threaten the safety and security of nuclear power plants across the country. A new report released today by the Massachusetts Public Interest Research Group (MASSPIRG) documents a history of safety problems at nuclear reactors in the United States. These incidents – like the crisis at the Fukushima Daiichi power plant in Japan – illustrate that nuclear power carries with it risks that are simply not worth taking. The 2006 Scorecard looks at the most important public interest votes taken between February 9, 2005 and February 1, 2006 in the U.S. Congress. These votes determined the direction of federal policy on critical issues ranging from environmental preservation to health care to consumer protections. Janet Domenitz and Summer Policy Intern testified at the State House today, Tuesday July 28th, 2015, in favor of simultaneously improving safety standards for nuclear power stations and moving beyond nuclear power and embracing renewable energy sources. Cape Cod Bay Watch on released a scathing new report that documents how Entergy Corporation, owner of the Pilgrim Nuclear Power Station in Plymouth, destroys marine life and pollutes Cape Cod Bay by using an outdated “once-through” cooling water system to run Pilgrim.